Our right to a free and open Internets has been under threat lately. The NSA — btw, that stands for the National Security Agency, which has the fancy responsibility of analyzing and acting upon security data — has gotten into the habit of spying on Americans with no justification (including 12 spies who were using NSA tools to spy on their significant others). No, I’m not kidding. The FCC — btw, that stands for the Federal Communications Commission, which is supposed to regulate and protect our communications channels — just made it easier for big companies to control the speed at which you are allowed to access particular websites. For example, your Internet company (i.e., Comcast or Verizon) could turn into a tiered pay system. So instead of being like a public utility where everyone gets the same amount of water or electricity, Verizon could give Netflix faster access for a fee, but then the smaller start-up that wants to compete and couldn’t afford it would get slower access. The Internet has become one of the most important resources in our lives. It’s a shared resource that all of us take part in. Government spying on it and corporate interference in it are probably not things we want for the future. So Mozilla had some children voice concern for their own future. Because it’s important. What kind of web do you want? We are consumers and nothing more. Fish in a bowl. The Net — and the Web especially — is a container. Advertisers have a right to target us in that container. And to track us so we can be targeted. Negative externalities, such as data pollution, don’t matter. This can all be rationalized as an economic necessity. We are not fish. Rather, as Cluetrain put it (in 1999! ), we are not seats or eyeballs or end users or consumers. we are human beings and our reach exceeds your grasp. deal with it. The Net was designed as a wide open space where all the intelligence that matters is at its ends, and each of us sits (stands, walks, drives) at one. Even if advertisers have a legal right to target us, their manners are terrible and doomed for correction. Negative externalities matter. A lot. As Fred said in his talk, we eventually dealt with the pollution caused by industry, and we’ll deal with it in the virutal world as well. The larger economic necessity is for a well-functioning marketplace. We’ll get that online once free customers prove more valuable than captive ones. The key is to replicate online the experience of operating as a free and independent customer in the physical world. For example, when you go into a store, your default state is anonymity. Unless you are already known by name to the people at the store, you are nameless by default. This is a civic grace. There is no need to know everybody by name, and to do so might actually slow things down and make the world strange and creepy. (Ask anybody who has lived in a surveillance state, such as East Germany before it fell, what it is like to be followed, or to know you might be followed, all the time.) We haven’t yet invented ways to be anonymous online, or to control one’s anonymity. But that’s a challenge, isn’t it? Meaning it is also a market opportunity. We’ve lived in a fishbowl long enough. Time to get human. I guarantee there’s a lot more money coming from human beings than from fish whose only utterances are clicks. We’re overdue an update on the Omie Project…., so here goes. We at Customer Commons believe there is room/ need for a device that sits firmly on the side of the individual when it comes to their role as a customer or potential customer. That can and will mean many things and iterations over time, but for now we’re focusing on getting a simple prototype up and running using existing freely available components that don’t lock us in to any specific avenues downstream. Our role is demonstrate the art of the possible, catalyse the development project, and act to define what it means to ‘sit firmly on the side of the customer’. For now, we’ve been working away behind the scenes, and now have a working prototype (Omie 0.2). But before getting into that, we should cover off the main questions that have come up around Omie since we first kicked off the project. At this stage we don’t propose to have a tight definition as the project could evolve in many directions; so our high level definition is that an Omie is ‘any physical device that Customer Commons licenses to use the name, and which therefore conforms to the ‘customer side’ requirements of Customer Commons. 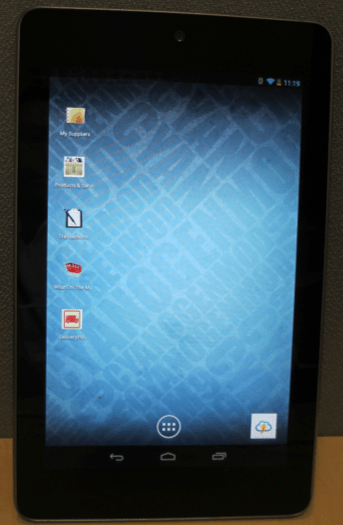 Version 1.0 will be a ‘Customer Commons Omie’ branded white label Android tablet with specific modifications to the OS, an onboard Personal Cloud with related sync options, and a series of VRM/ Customer-related apps that leverage that Personal Cloud. All components, wherever possible, will be open source and either built on open specs/ standards, or have created new ones. Our intention is not that Customer Commons becomes a hardware manufacturer and retailer; we see our role as being to catalyse a market in devices that enable people in their role of ‘customer’, and generate the win-wins that we believe this will produce. Anyone can then build an Omie, to the open specs and trust mechanisms. What kind of apps can this first version run? 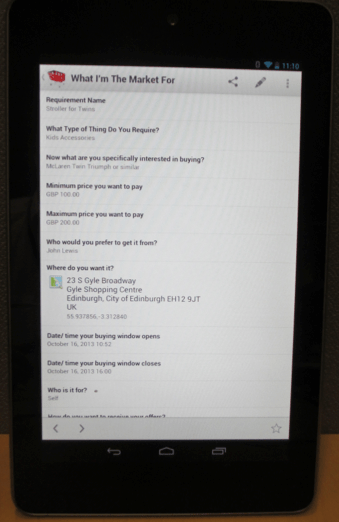 We see version 1 having 8 to 10 in-built apps that tackle different aspects of being a customer. The defining feature of all of these apps is that they all use the same Personal Cloud to underpin their data requirements rather than create their own internal database. Beyond those initial apps, we have a long list of apps whose primary characteristic is that they could only run on a device over which the owner had full and transparent control. We also envisage an Omie owner being able to load up any other technically compatible app to the device, subject to health warnings being presented around any areas that could breach the customer-side nature of the device. How will this interact with my personal cloud? As noted above, we will have one non-branded Personal Cloud in place to enable the prototyping work (on device and ‘in the cloud’), but we wish to work with existing or new Personal Cloud providers wishing to engage with the project to enable an Omie owner to sync their data to their branded Personal Clouds. Where are we now with development? We now have a version 0.2 prototype, some pics and details are below. We intend, at some point to run a Kickstarter or similar campaign to raise the funds required to bring a version 1.0 to market. As the project largely uses off the shelf components we see the amount required being around $300k. Meantime, the core team will keep nudging things forward. We are aiming for a more public development path from version 0.3. We’re hoping to get the Omie web site up and running in the next few weeks, and will post details there. Alternatively, if you want to speed things along, please donate to Customer Commons. Below are a few pics from our 0.2 prototype. Home Screen – Showing a secure OS, a working, local Personal Cloud syncing to ‘the cloud’ for many and varied wider uses. This one shows the VRM related apps, there is another set of apps underway around Quantified Self. My Suppliers – Just as a CRM system begins with a list of customers, a VRM device will encompass a list of ‘my suppliers’ (and ‘my stuff’). 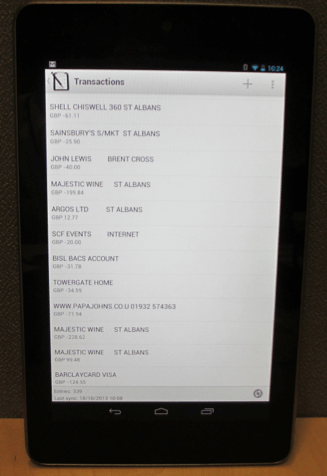 My Transactions – Another critical component, building my transaction history on my side. Intent Casting/ Stroller for Twins – Building out Doc’s classic use case, real time, locally expressed intention to buy made available as a standard stream of permissioned data. Right now there are about 50 online sellers ‘listening’ for these intent casts, able to respond, and doing business; and 3 CRM systems. So what have we learned in the build of version 0.2? Firstly, that it feels really good to have a highly functional, local place for storing and using rich, deep personal information that is not dependent on anyone else or any service provider, and has no parts of it that are not substitutable. Secondly, that without minimising the technical steps to take, the project is more about data management than anything else, and that we need to encourage a ‘race to the top’ in which organisations they deal with can make it easy for customers to move data backwards and forwards between the parties. Right now many organisations are stuck in a negative and defensive mind-set around receiving volunteered information from individuals, and very few are returning data to customers in modern, re-usable formats through automated means. Lastly that the types of apps that emerge in this very different personal data eco-system are genuinely new functions not enabled by the current eco-system, and not just substitutes for those there already. For example, the ‘smart shopping cart’ in which a customer takes their requirements and preferences with them around the web is perfectly feasible when the device genuinely lives on the side of the customer. We launched our first research paper today: Lying and Hiding in the Name of Privacy (PDF here) by Mary Hodder and Elizabeth Churchill. Our data supporting the paper is here: Addendum Q&A and shortly we’ll upload a .xls of the data for those who want to do a deep dive into the results. We all know that many people hide or submit incorrect data, click away from sites or refuse to install an app on a phone. We’ve all mostly done it. But how many? How much is this happening? We’re at IIW today and of course, the age old dilemma is happening in sessions where one guy in the room says: “People will click through anything; they don’t care about privacy.” And the next guy will say, “People are angry and frustrated and they don’t like what’s happening.” But what’s real? What’s right? We conducted this survey to get a baseline about what people do now as they engage in strategies to create privacy for themselves, to try to control their personal data. The amazing thing is.. 92 % hide, lie, refuse to install or click, some of the time. We surveyed 1704 people, and had an astonishing 95% completion rate for this survey. We also had 35% of these people writing comments in the “comment more” boxes at the bottom of the multiple choice answers. Also astonishingly high. People expressed anger, cynicism, frustration. And they said overwhelmingly that the sites and services that ask for data DON’T NEED it. Unless they have to get something shipped from a seller. But people don’t believe the sites. There is distrust. The services have failed to enroll the people they want using their services that something necessary is happening, and the people who use the services are mad. We know the numbers are high, and that it’s likely due to many not having a way to give feedback on this topic. So when we offered the survey, people did vent. But we think it also indicates the need for qualitative and quantitative research on what is true now for people online. We want more nuanced information about what people believe, and how we might fix this problem. Many sites only look at user logs to figure out what is happening on a site or with an app, and therefore, they miss this problem and the user feelings behind them. We want to see this studied much more seriously so that people no longer make the conflicting statements at conferences, so that developers say the user’s don’t care, so that business models are developed that think different than we do now, where sites and services just take personal data. We want to get beyond the dispute over whether people care, to real solutions that involve customers and individuals in ways that respect them and their desires when they interact with companies. A large percentage of individuals employ artful dodges to avoid giving out requested personal information online when they believe at least some of that information is not required. These dodges include hiding personal details, intentionally submitting incorrect data, clicking away from sites or refusing to install phone applications. This suggests most people do not want to reveal more than they have to when all they want is to download apps, watch videos, shop or participate in social networking. Customer Commons’ purpose in conducting this research is to understand more fully the ways in which people manage their online identities and personal information. This survey, the first of a planned series of research efforts, explores self-reported behavior around disclosure of personal information to sites and services requesting that information online. We believe the results of this survey offer a useful starting point for a deeper conversation about the behaviors and concerns of individuals seeking to protect their privacy. Subsequent research will explore how people feel and behave toward online tracking. This research is also intended to inform the development of software tools that give individuals ways to monitor and control the flow and use of personal data. For this research project, Customer Commons in late 2012 surveyed a randomized group of 1,704 individuals within the United States (1,689 finished the survey, or 95%). Respondents were geographically distributed, aged 18 and up (see the appendix for specifics), and obtained through SurveyMonkey.com. The margin of error was 2.5%. This survey focused on the methods people use to restrict disclosure of requested personal information. Those methods include withholding, obscuring or falsifying the requested information. 73.4% avoided giving sites or services access to a friend or contact list. 68% reported they either didn’t know the site well when they withheld their data or didn’t trust the site. 45% of those who felt they knew the site or service well still withheld information. 12% said it was never needed. Respondents also believed that other users of these services always needed or expected correct personal data about each other 27% of the time, whereas 23% said it was sometimes needed, and 48% said it was never needed. The results of this survey support the hypothesis that people limit, refuse to give or obfuscate personal information in an attempt to create a measure of privacy online. These survey responses show people resort to withholding data or submitting false data to avoid feeling exposed online. When deciding whether to share personal information, the majority of respondents doubt that sites or services need to collect more than a minimum of obviously necessary personal data. When people withhold personal data, it is to create a sense of privacy and control of their personal lives. People are afraid or distrustful of sites, services and phone apps that request their personal data. They withhold or falsify information because they do not believe the sites need their data, and because they do not want to disclose information that might lead to spamming or other intrusions. Moreover, the techniques that people employ to preserve their sense of privacy online are largely improvised, informed by fear, and based on their subjective evaluation of entities that solicit personal information. For the sake of privacy, people contribute to and tolerate the presence of incorrect personal data online, and attempt to correct it only when they see the clear upsides of accuracy. And, despite the failure of businesses and other organizations to convince users of the need to provide personal details beyond an email address, most users remain comfortable disclosing additional personal data only with those they know and trust. This research project was funded with a grant from CommerceNet, a not-for-profit research institute working to fulfill the potential of the Internet since 1993. Customer Commons is a not-for-profit working to restore the balance of power, respect and trust between individuals and the organizations that serve them, especially in the online world. We stand with the individual and therefore do not take contributions from commercial entities. Click here to see the complete questions, answers and written answers offered by people to provide additional information. 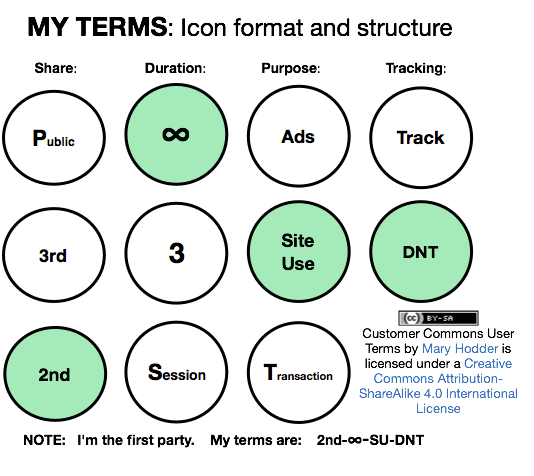 [ii] Doc Searls, The Intention Economy: When Customers Take Charge. (Cambridge, Massachusetts: Harvard Business Review Press, 2012). P. 28.